Should you Substitute Honey for Sugar? Do you regularly swap the sugar in your food and drinks for honey thinking you’re doing yourself a favor because this is the healthier option? I know I do. So I decided to research the topic and find out the truth. The results were surprising. Honey is that beautiful golden amber liquid made by bees from the nectar of flowers. Some might call it “nectar of the Gods”. Whereas sugar is that white crystalline or powdered substance, made from sugarcane or sugar beets. White sugar is 99.9 percent sucrose, made up of 50 percent glucose and 50 per cent fructose, which has been refined from sugarcane with all the impurities such as mineral ash completely removed. Superfine and powdered sugar either have smaller crystals or are ground to a fine powder. Brown sugar contains 95 per cent sucrose with some molasses added. All have one thing in common, they have little to no nutritional value. Honey, is also mostly made of sugar, with 31 percent glucose, 38.5 percent fructose and about 17% water. The remaining consists of disaccharides, trisaccharides, oligosaccharides, enzymes, and small amounts of minerals (such as selenium, magnesium, chromium, and potassium). 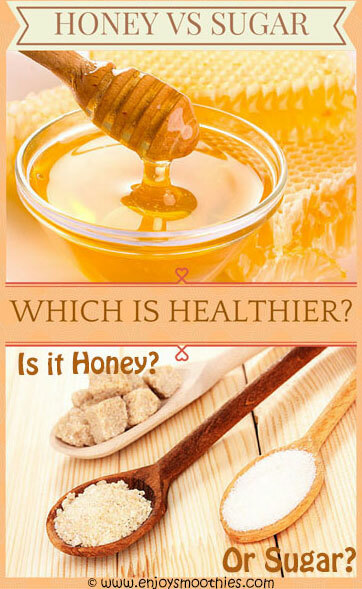 There are also small amounts of vitamins, such as B vitamins and vitamin C.
So, is honey better than sugar? Let’s compare the two. A teaspoon of honey has 22 calories while a teaspoon of sugar has 16 calories. But honey is denser than sugar, so gram for gram, honey has fewer calories. Honey has 300 calories per 100 grams, while sugar has 400 calories. But most of us don’t measure our honey by weight, we simply spoon it out of the jar. So if you are swapping sugar for honey by the spoonful, you need to use less, otherwise you will be consuming more calories. Fructose is sweeter than glucose and sucrose. Because honey has slightly more fructose than glucose, it has a sweeter taste. So you actually need to use less to achieve the same level of sweetness. Sugar and honey have similar GI scores. Sugar has a GI score of around 60, which is moderate. Honey’s GI score depends on the type of nectar the honey bees ate, but normally ranges from 35 to 64. Unlike sugar which has no nutritional value, honey does contain some nutrients, such as vitamin B2, vitamin C, calcium, zinc, potassium, iron and some magnesium. But the quantities are tiny and not at significant levels. You would have to consume enormous amounts of honey to get any major nutritional benefits. But honey is much more than simple sugar. While it’s true that in terms of vitamins, minerals, amino acids and protein honey offers little in the way of nutrition, it does have some properties that provide unique health benefits. Honey has been found to possess some specific antibacterial and anti-inflammatory properties. When applied topically to wounds or burns honey does have healing properties. Wounds heal faster when kept moist, but these conditions can be a breeding ground for bacteria. Honey keeps the wound moist while at the same time killing the bacteria. Honey is also useful for soothing coughs and sore throats. Honey has long been mixed with lemon to create a soothing elixir. Many people take honey mixed with warm milk before going to bed as a sleep aid. Honey is popular among endurance athletes. As a simple carbohydrate it is easily digested and readily absorbed into the bloodstream giving an instant energy boost and aiding muscle recovery. It also contains fructose, which has a slower rate of absorption giving a slower and more sustained energy release. Honey shouldn’t be given to very young children under the age of 12 months, because of the small chance of ingesting spores and contracting the potentially life threatening botulism. One of the reasons honey is better than sugar is the fact that it’s a natural product. But this claim can really only be made for raw honey. Raw honey, honey in its purest form, has not been filtered, strained or heated above 115 degrees F.
But the reality is that most of the honey sold in our supermarkets has been heated and filtered so that many (if not all) of the nutrients have been completely destroyed, which means that many of the above benefits won’t apply. Raw honey still retains all the pollen, honeycomb, propolis, enzymes and other micronutrients that are normally destroyed during the manufacturing process. Propolis is a mixture of resins the honeybees use to protect their hives from viruses and bacteria. It is this that gives honey its antibacterial, antiviral and antifungal properties. So, to answer the question “is honey better than sugar”, if you are using it as a straight out substitution for sugar, you will be consuming the same, if not more calories and getting minimal vitamins and minerals. The good news is because of its concentrated sweetness, you can use less. However, it is a great source of instant energy, is very soothing for colds and sore throats and has proven antibacterial and anti-inflammatory properties. So it still has to be better than any form of sugar which contains zero goodness.